“But Joseph said to his brothers, ‘Fear not, for am I in the place of God? As for you, you meant evil against me; but God meant it for good, to bring it about that many people should be kept alive, as they are today” (Genesis 50:19-20). We’ve touched on the account of Joseph and his brothers several times in our devotions so far, as the daily lectionary followed the story chapter-by-chapter in Genesis. However, now we come to the culmination of the account as Father Israel is now dead and buried, and without their father to stay Joseph’s anger and revenge, his brothers are worried that Joseph will hate them and try to pay them back for the evil they did to him. If only we could see the future, we could better accept what sometimes seems like momentary evil, realizing that God will bring good to pass in the end. This is especially true when we feel we have been wronged by a friend, neighbor or family member. Often, the hurt is very deep and can create a desire for revenge, for “getting even.” We are best served by forgiveness and trusting that God will bring good from evil, so that many will be blessed in the end. The story of Joseph and his brothers presents us with a valuable lesson, even as we live thousands of years later. The lesson is that forgiveness of others and trust in God will carry us further than anger, bitterness and vengefulness. This Lenten season, perhaps there is someone who has wronged you and you have been withholding forgiveness. 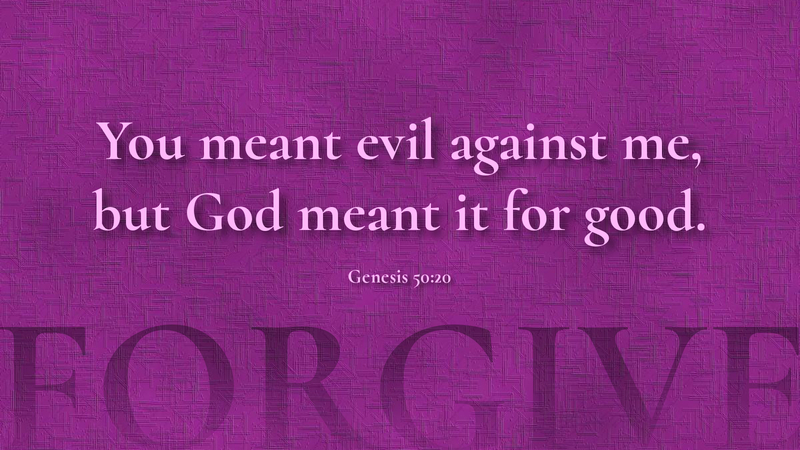 Because God can turn evil into good, perhaps now would be an appropriate time to forgive and trust God. Prayer: Almighty God, as we have been forgiven, help us to forgive others as we trust in your plan and your providence; through Christ our Lord. Amen.